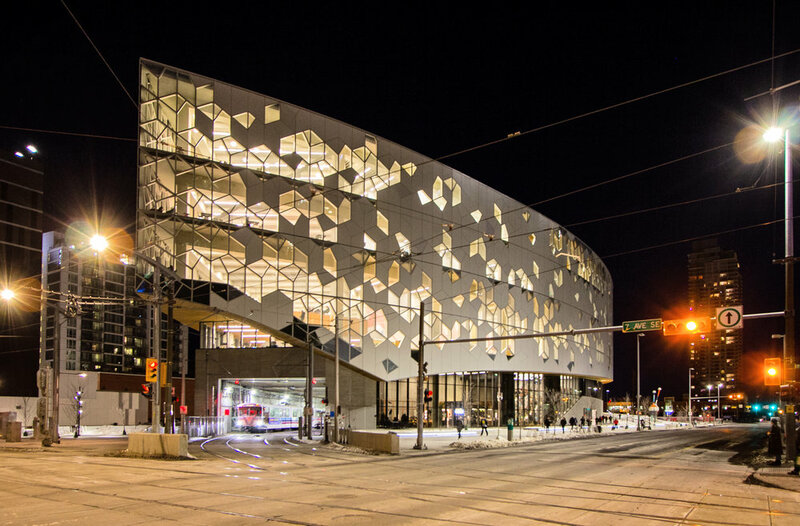 The New Central Library was conceived as an intuitive and inclusive place. Designed by Snøhetta and Dialog, it houses more than 30 community meeting areas, space for children, for teens, and even a recording studio. 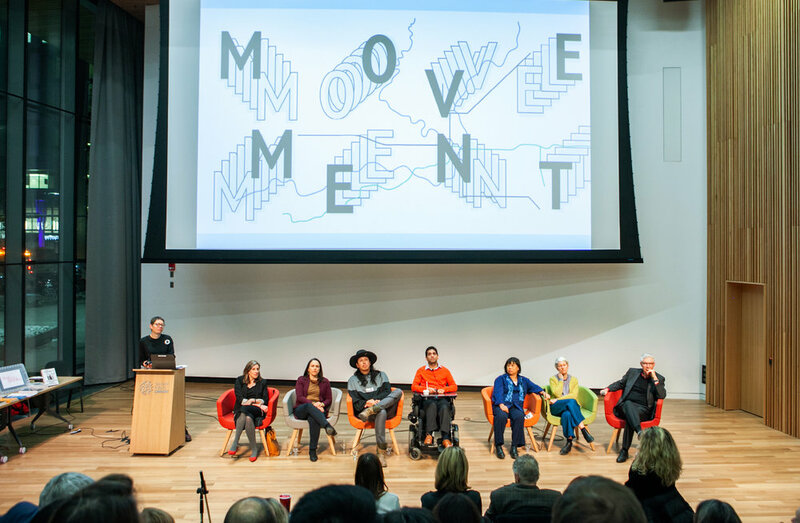 We couldn’t think of a better place in the city to have an important conversation about movement. An LRT line emerges from below grade at the corner, the train stop is footsteps away. The two-story glazed wall of the performance hall gives the audience a view of those passing by on the sidewalk and street. Activity is visible inside as well: two pedestrians stopped by the window, noticed the “movement” logo on the screen, and posed a few break dancing moves during the discussion. The connectivity is genuine. Marianna Vaidman Stone is the Deputy Director of Gehl Institute, an organization focused on getting public life on the agenda of cities. They study the experience of public places and encourage cities to transform by making public life a driver for design, policy, and governance. Marianna joined Gehl Institute in April 2018. Prior to this, she served as Chief of Staff to New York City Council Member Daniel R. Garodnick, whose district covered some of New Yorks’ premier public spaces. She worked on the development of a zoning framework that’s expected to generate hundreds of millions of dollars for public realm projects in East Midtown. She currently serves as an Alternate Director on the public body charged with administering those funds. Before moving into public sector and advocacy work, Marianna was a commercial litigator at Debevoise & Plimpton, a major New York law firm. Cowboy Smithx is an Award Winning filmmaker of Blackfoot Ancestry from the Piikani and Kainai tribes of Southern Alberta, Canada. Cowboy is the founder and curator of the highly acclaimed International Indigenous speaker series “REDx Talks." He also serves as the Artistic Director of the Iiniistsi Treaty Arts Society, a non-profit organization dedicated to activating the true spirit and intent of Treaty #7. Cowboy writes, directs and produces film works in documentary, narrative, music video and experimental. He is currently working in Indigenous education, Cultural consultation and Youth work around the world. Cowboy has been featured as a keynote presenter at over 150 conferences, symposiums and festivals across the globe. Cowboy facilitates dozens of interactive workshops for professionals, artists, youth and elders. Cowboy is also the founder of the Elk Shadows Performing Arts Clan and the Noirfoot School For Cinematic Arts. Giovanna Borasi is an architect, editor, and curator. She joined the Canadian Centre for Architecture (CCA) in 2005 as Curator for Contemporary Architecture, and in 2014 she was appointed Chief Curator. Borasi’s research focuses on contemporary architecture discourse, with a particular attention to alternative ways of practicing and evaluating architecture and how environmental, political, and social issues influence today’s urbanism and built environment. Exhibitions and publications by Giovanna Borasi include What About Happiness on the Building Site? (2017); Besides, History: Go Hasegawa, Kersten Geers, David Van Severen (2017); The Other Architect (2015); Imperfect Health: The Medicalization of Architecture (2012); Journeys: How Travelling Fruit, Ideas, and Buildings Rearrange our Environment (2010); Sorry, Out of Gas: Architecture’s Response to the 1973 Oil Crisis (2007); and Environ(ne)ment: Approaches for Tomorrow (2006). Borasi studied architecture at the Politecnico di Milano, after which she worked as an editor for Lotus International (1998–2005) and Lotus Navigator (2000–2004), and was Deputy Editor in Chief of Abitare (2011–2013). Before joining the CCA, Borasi co-curated House Sweet Home, Different Ways to Live, Spazio Ventisette, Milan (2000), and collaborated on several exhibitions including Asfalto, Il carattere della città at the Milan Triennale (2003), and Notizie dall’Interno, the Italian Pavilion for the 9th Architecture Biennale in Venice (2004), both with Mirko Zardini. Borasi has written widely on contemporary architecture, and her work has appeared in publications such as ARCH+, 2G, Cartha, and PLOT. She has served on international juries and regularly speaks at symposia and conferences. City Councillors Druh Farrell and Evan Woolley were in attendance. Councillor Farrell opened with remarks and a fitting challenge: empathy. We need to imagine a city that works for everyone. One of the themes emerging from the discussion was the relationship between land use and mobility. The area of Calgary is 1,000 square kilometres (40km north to south and 25km east to west). When we envision how we move through the city, Amanda Kolson Hurley proposed, we think of our movement as a hub—like a bicycle wheel with spokes. Everything connects to the centre. Real-life movements are much messier, however, and might instead appear as a “pick-up-sticks” drawing (an idea Hurley credited to Shlomo Angel). This poses a challenge for movement: it’s easy to get downtown, but hard to cross town between two neighbourhoods. As humans, social interaction and connectivity are key. Giovanna Borasi described a project by Cedric Price in the pre-internet 1970s that used a bus tour in the U.K. The bus, a traveling recording studio, networked conversations between university students at different universities. Don Mulligan reminded us that the social interaction on a freeway is typically limited to when there is a collision and you need to hop out of the vehicle to exchange insurance details. So let’s consider the impact of our infrastructure carefully. Cowboy Smithx reminds us that Calgary’s ancestral land at the confluence of the Bow and the Elbow Rivers has left us all as Treaty people, with an inherited role to support each other. Brigitte Shim started her presentation with a world map illuminating all the cities. Zooming in, she brought attention to the overlooked back alley. The laneway is an opportunity to create more intensive use. What if you could live in a village in the middle of the city? In Toronto, the laneway is now considered as an opportunity to increase affordable housing. The conversation moved from the relationship between public realm improvements, a possible side-effect of gentrification and disruptive technology—its hopes but also a cautionary note. Marianna Vaidman Stone, who had shown the rich human scale that took place in the transformation of Times Square (where 90% of people move on foot), offered that disruptive technology is a tool, not a solution. It’s equally important to consider the unintended consequences of data collection, mobility networks, and the control of the technology. A final question provoked the unusual experience of someone motoring through an urban space in a wheelchair. Nabeel Ramji was asked if he felt like a pedestrian. He replied that he did not, but that was also part of the reason why he is working to call attention to better design that addresses universal access. If Statistics Canada reports one in five Canadians over the age of 15 experience a disability that influences their daily life (2017), this challenge is not for an isolated population. One of our largest take-aways is that the work has only begun. Giovanna Borasi, in her introductory remarks, showed a slide of a quote from Gordon Matta-Clark that’s in the CCA archives. It reads: “Here is what we have to offer you in its most elaborate form—confusion guided by a clear sense of purpose.” With that, we hope that you might join us to continue to explore the topic of movement with more depth. We ended the evening with an announcement of the Movement Call for Ideas. We’ll be developing an exhibition and some smaller activities to connect with the winning ideas throughout 2019. You can participate in an open call for your ideas on movement in your neighbourhood. Send an image or a poem or story that describes movement to you. Submissions received by April 30th will be considered for an exhibition in the spring. The Panelist book is called The Civic City in a Nomadic World by Charles Landry, and can be found at Shelf Life Books. It explores contemporary considerations of movement, and brings a planning lens to things that are “softer” than hard infrastructure, things that consider how people mix, and how they connect within the hard structures we’ve built. Read a review of the book here. This event was supported by: The City of Calgary, The Government of Alberta and the Alberta Foundation for the Arts. A special thanks to Urban Systems for hosting the Meet the Panelists Member’s Reception. Thanks to the week’s in-kind support of Sidewalk Citizen Bakery, Brewsters, Luke’s, Vine Arts, Empire Foods, Rosso Coffee and Little Rock Printing. A generous thank you to the d.talks individual and organizational members, without whom the event would have not happened! And finally, thanks to our volunteers, those who sport the black and white badges at the event make everything so easy.